It’s no secret that carwash business is booming. 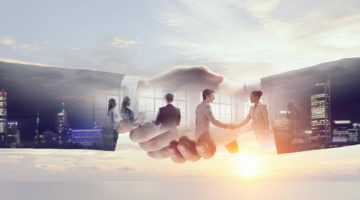 But, the key to continued business growth is to stay up-to-date on equipment that enhances the customer experience — even the types of equipment that customers may simply take for granted. 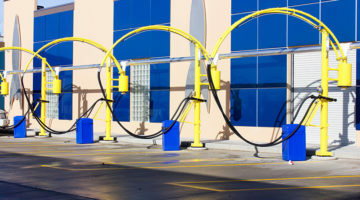 For instance, at self-serve carwashes, booms are an integral component of a bay, but they’re not going to be something a customer takes note of until he or she starts using them. After all, different styles and configurations provide varying flexibility and ease-of-use for customers. Another type of boom in the carwash industry is the vacuum boom, which continues to grow in popularity. These booms not only provide a stylish vacuum plaza and site exterior, but they also serve a practical purpose. This article will take a look at recent updates in the carwash boom market. 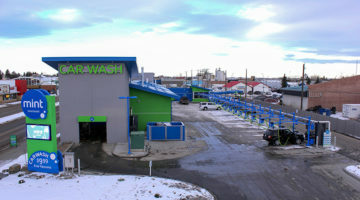 The cost difference between starting a self-serve wash and a tunnel wash is significant, and as such, the self-serve format remains an attractive option for new investors. At the same time, today’s emphasis on the express exterior carwash model has given rise to the belief that the self-serve model is old-fashioned and falling by the wayside. However, this is a false supposition, and going into a new carwash business with this mindset is dangerous, because you’re setting yourself up for failure from the start. The truth is, self-serve washes still have core customers that remain committed to washing their cars with their own hands, and if you can provide a facility with both value and quality, you will then be setting yourself up for success with this base. One such high-quality product that you can install is the humble boom. One of the critical, but perhaps most subtle, pieces of equipment in a self-serve carwash is the boom. Did you know origins of the carwash boom can be traced back to 1948? According to Peter Zierden, president of Zierden Co., the first low-pressure boom was introduced to the market at this time. Back then, the boom was a swivel that relied on city water pressure and an attached garden hose to wash cars. The high-pressure booms we are familiar with today were not introduced until 1963, Zierden says. Today, there are two main types of booms: 360-degree rotation ceiling or center booms and 180-degree rotation wall booms. “Center mounts are generally for the high-pressure wash along with other products that pass through, such as wax, spot-free rinse and other products. Wall-mounted booms are generally for the foaming brush applications,” Zierden explains. However, ceiling booms are offered in a variety of styles and configurations, such as inline and Z-style booms. An inline boom is the classic, straight model that was originally introduced to the market in the 1960s. The Z-style, on the other hand, has a Z-like bend in its shape, allowing you to install multiple ceiling booms in the bay, especially if you are restricted on space. In fact, when looking to add multiple options, operators also have the opportunity to purchase dual- and triple-stack ceiling booms, Sokolski adds. Integrated power rings that allow the use of LED lighting as both an additional lighting/safety feature and an eye-catching display. The next innovation to hit the market, Sokolski adds, will be a heated boom to eliminate freeze-ups and water waste from using a weep system. Booms aren’t only to be found in self-serve bays, however. Today, vacuum booms have become so popular, they’re almost expected at new carwash builds. What has driven this popularity? 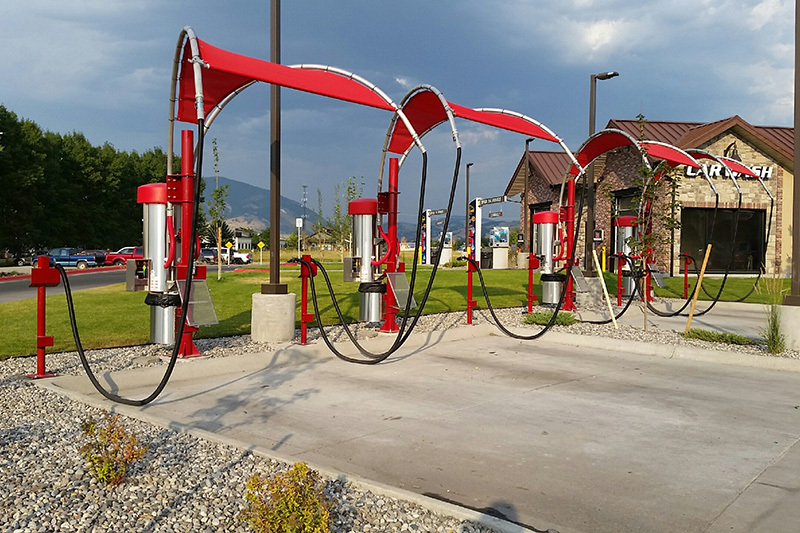 “Booms, also called vacuum delivery arches or simply arches, are the ideal combination of form and function when it comes to carwash vacuums,” Steve Lieneman, vice president of sales and marketing for Vacutech, states. With a traditional vacuum setup, where hoses were looped on the sides of vacuums, customers struggled with moving hoses around their cars, and the hoses in turn were often damaged from being dragged around and run over. Furthermore, they were very difficult to put back in a tidy manner. With the development of vacuum booms, manufacturers sought to remedy these problems. Hence, vacuum booms were developed to act as structures that keep hoses neatly stored and suspended off the ground, both preventing damage and providing convenience and easy access for customers on both sides of their vehicles. Of course, this popularity has also had other effects on the market. Vacuum booms can be engineered to work with self-serve canister vacuums or central vacuum systems. There are a variety of styles and configurations on the market to suit your wash, and much of it can be customized. Whether you’re looking for single-vacuum booms, dual-vacuum booms, booms with extended reach or more, there are options available. In addition, vacuum booms are modular, meaning that you can add arches on as your business grows (assuming, of course, that you have the room to expand and have ensured that your vacuum power equipment can accommodate these additions or that it has been upgraded to handle extra arches). Furthermore, all piping, airlines and electrical can be concealed in the post, and a discreet flush mount allows for routine maintenance. However, even for customers not trained to associate booms with free vacuums, the booms themselves provide a more attractive structure than the traditional vacuum canister. In fact, the variety of accessories you can purchase to modify the booms helps both in terms of curb appeal and practicality. For instance, you can have the booms painted in a custom color or color scheme to match your branding. You can also integrate canopies, LED lights and advertising displays. Jennifer Wall, sales and marketing manager at J.E. Adams, cannot state enough the importance of adding LEDs to carwash vacuum booms nowadays. “It keeps the site attracting customers 24/7 and helps customers feel safe, especially in the winter months when daylight is limited,” Wall notes. Tools, such as crevice, duck claw and express vacuum nozzles. Meters. “Today’s technology in the post separator can provide metered vacuums. Carwash owners can decide how long each customer vacuums for free. Suction is activated by coin/token, keypad or ground loop sensors. The suction automatically shuts off when the time is up. Of course, more time can be available for purchase,” Taggart notes. Underground or aboveground installations. Piping from the vacuum producer and between the booms can run overhead or it can run underground. Quick disconnects. These allow hoses to be taken down quickly during closed hours for carwashes in high-theft areas. While our experts agree that the configuration of these booms largely depends on each site, it’s a best practice to make vacuum stalls 12- to 14-feet wide (carwashes that see more trucks and SUVs may want to consider 14 feet) to allow for the doors on each side of the vehicle to be open without hitting anything. Maintaining these booms is fairly simple. For instance, you will need to empty out the debris buckets daily and periodically look for leaks or worn tools. Depending on your traffic count, a semi-annual or annual cleaning of the arch or manifold may be warranted to prevent clogging. In fact, whether it is for leaks or attaching claws, the experts we interviewed agree that duct tape has no place being on a hose. Rather, you need to replace what is broken. After all, the maintenance of your carwash and its vacuums reflects back on you, and your customers will associate any unmaintained parts of the wash as a downgrade in overall quality. Meagan Kusek is the assistant editor of Professional Carwashing & Detailing.